Annotate your documents, audio and videos from any browser. Support for all standard XFDF annotation features: sticky notes, highlight, strikethrough, text box, line, arrow, circle rectangle, stamps. Additionally collaboration, indexing, and redaction can be done from within OpenAnnotate. View and annotate documents within a 100% HTML interface directly in the browser (IE 10+, FireFox, Safari, Chrome) without dependencies on Adobe Reader or other client viewing applications. OpenAnnotate can even run offline. OpenAnnotate fully supports PDF standards for storing annotations as separate XFDF files to allow compatibility with other PDF products. 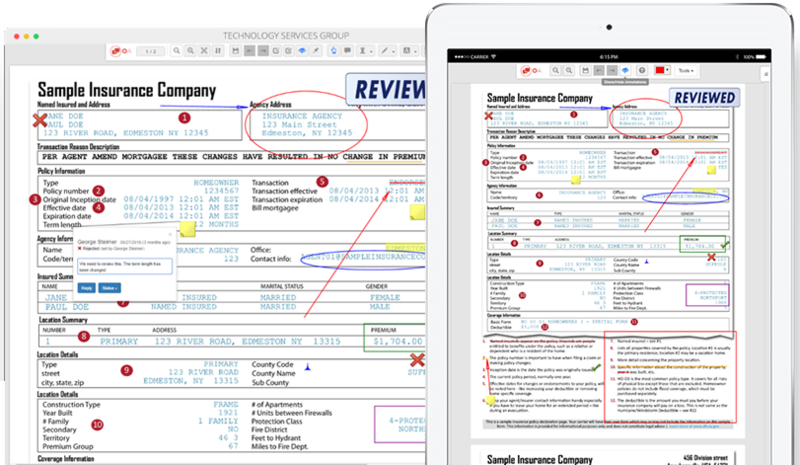 OpenAnnotate can produce annotated PDF for sharing in other PDF (ex: PDF Reader) environments. Runs on the most popular ECM platforms: Documentum, Alfresco and Hadoop. Connectors are available for Webtop, FirstDoc, CARA and Alfresco Share as well as TSG’s OCMS interface. OpenAnnotate will even display annotations originally generated using Documentum PDF Annotation Services. Users only have access to image renditions of individual document pages preventing them from downloading an entire document and distributing it outside of the managing application. Annotate live with other viewers and easily collaborate with integrated chat. Users can easily view changes and catch-up on comments via an easy to navigate history panel. OpenAnnotate currently supports a variety of document types and business scenarios. Take a tour of the OA interface and try it for yourself. For a licensing quote or to schedule a demo, please complete the form. TSG develops modern enterprise-level software for Documentum, Alfresco or Hadoop and releases it to our client community with a Visible Source model rather than a conventional software purchase arrangement. Clients that are tired of typical ECM vendor’s “one size fits all” interfaces leverage TSG’s unique approach of providing both consulting services and software to quickly develop and deploy innovative and modern solutions. 2018 Technology Services Group. All rights reserved.